“The UK’s number one restaurant booking website” is what it says on the homepage of http://www.opentable.co.uk/. 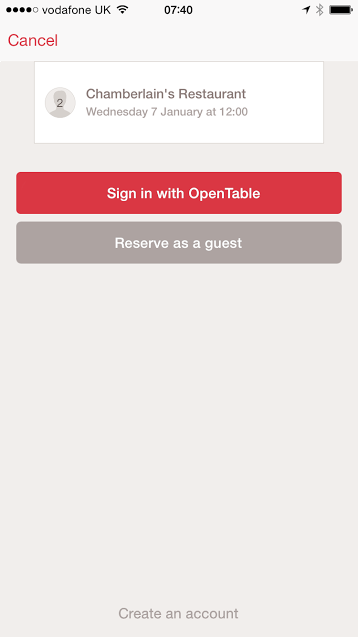 One of the reasons why I was keen to find out more about OpenTable is the fact that it serves two types of customers since its connects restaurateurs with customers. This is a similar mechanism which Carwow specialises in, a website which I reviewed previously. How did this app come to my attention? – I found out the other day that “TopTable”, a restaurant booking site which I’ve used in the past, had been taken over by OpenTable. It’s always good to have a restaurant booking site at hand, reason why I decided to give OpenTable a try and do a quick review. 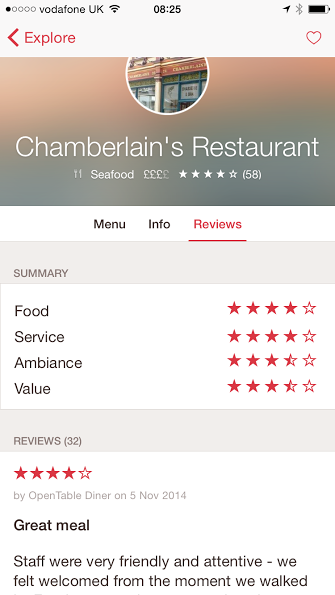 My quick summary of the app (before using it) – This is a restaurant booking site. I expect to be able to discover and book restaurants in my local area through this site. How does the app explain itself in the first minute? – Straightforward; a list of restaurants that I can book (see Fig. 1 below). Because I’ve enabled location tracking, the suggested restaurants are all in the area from where I’m accessing the app. 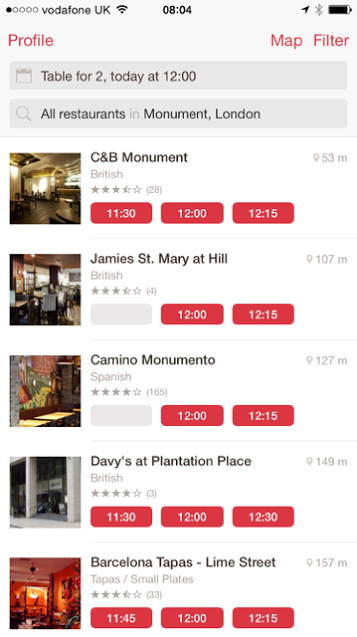 I can view available time slots per restaurants as well as star ratings and proximity. Getting started, what’s the process like (1)? 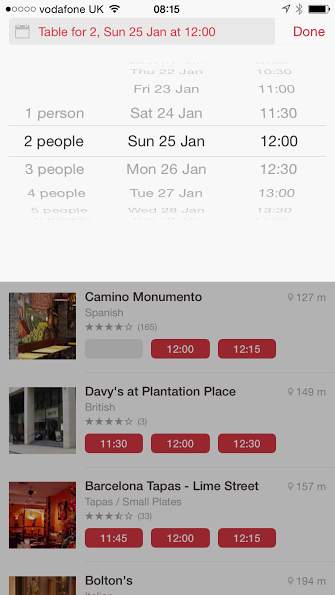 – I first decided to change the default setting from “Table for 2, today at 12:00” to 2 people on Sun 25 Jan at 12:00. 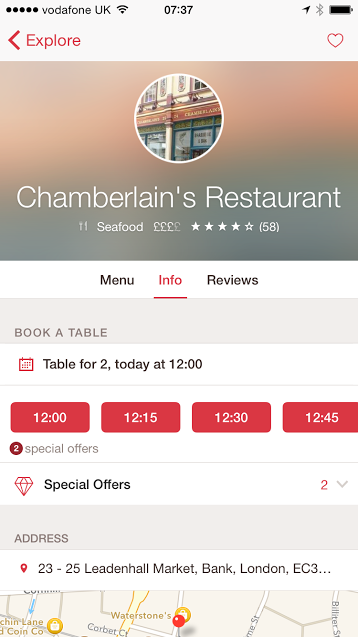 I then select “Chamberlain’s Restaurant” at 12:00, after which I get presented with a nice landing page for Chamberlain’s Restaurant (see Fig. 3 below). By default, the “Info” view is displayed for a restaurant, which means that the view offers practical info such as price range, cuisine and parking. When I switch to the “Reviews” view, I see that the restaurant is rated based on four criteria: food, service, ambiance and value (see Fig. 4 below). Getting started, what’s the process like (2)? – I then click on the red “12:00” button, after which I click on the “Reserve as a guest” button (see Fig. 5 below). 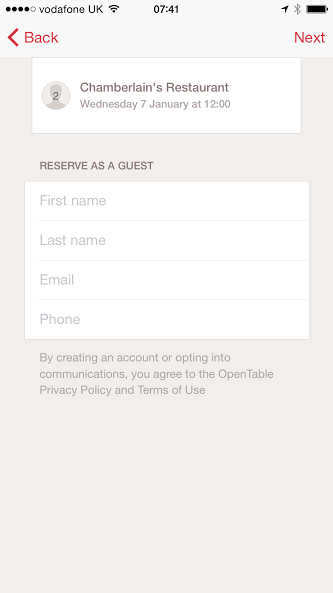 Signing up as a guest is simple, I just need to enter my first name, last name, email and phone – all the info I expect to submit when making a restaurant reservation (see Fig. 6 below). How easy to use was the app? – Very easy and intuitive. Granted, I didn’t do the whole Open Table sign-up process, but the design of the app is simple and provides the functionality that you’d expect. How does the app compare to similar apps? – I had a play with the iOS app of Bookatable, which felt very similar to Open Table. 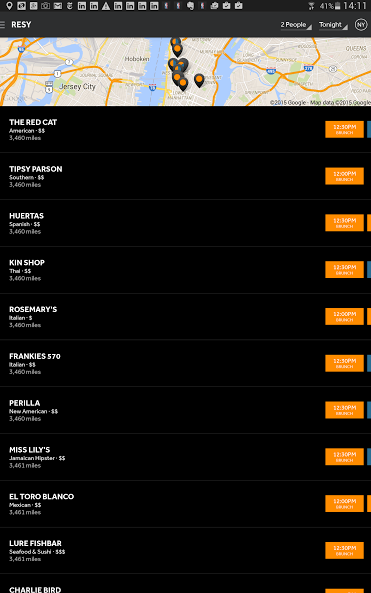 Whereas OpenTable seems to focus very much on displaying available time slots (see Fig. 1), Bookatable concentrates more on providing appealing visuals and highlighting good restaurant deals or “offers” (see Fig. 7 below). Another example, US oriented Resy, looks quite basic in comparison (see Fig. 8 below). Did the app deliver on my expectations? – Yes, although I expected the app to work harder on ‘drawing’ me in, explaining the benefits of OpenTable and really encouraging me to pick one of the restaurants recommended. The iOS app provides an easy to use and intuitive experience, but I believe it could provide a more compelling experience (see Fig. 9 below). 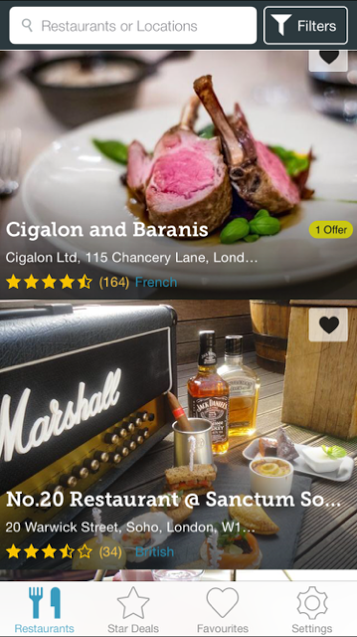 Highlight ‘hard to get’ bookings – Similar to US apps like Resy and Shout, it would be interesting if OpenTable were to highlight certain restaurants,e.g. based on reputation (and difficulty of getting into) or based on price. Personalised recommendations – Once I’ve made a few bookings through OpenTable, I expect to see or receive more personalised recommendations. I can imagine that OpenTable are already looking at best ways to engage with and retain their users, encouraging ‘personalised discovery’. Visually appealing – Some of the imagery currently available through OpenTable is fairly bland and nondescript. I feel that rich imagery can act as an first important pull to get the user to make a booking or to look at the available menu options or reviews for each restaurant.